Before gameplay sliders were implemented, our options for adjusting the gameplay were limited, and less than ideal. The Arcade/Simulation setting only toggled the rules and fatigue on and off, except for a couple of games where it also added some arcade style elements. Our best chance of modifying the gameplay was to make mass edits to player ratings, such as reducing speed and blocking, skewering rebounding to try to balance out the ratio of defensive to offensive boards, and so on. These tweaked rosters had limited success addressing core gameplay issues – indeed, some results could be chalked up to a placebo effect – and caused problems in Franchise mode. What we really needed were options that altered the gameplay regardless of the roster being used, and that’s where gameplay sliders came in. Whether it was a tendency, level of effectiveness, or some other aspect of the gameplay, sliders could be used to tweak the experience accordingly. Field goal percentages could be adjusted, and the overall game speed could be increased or decreased. The tendency for shots to be blocked could be tweaked as desired. Alternatively, a game could be changed to be faster paced and more arcade-like. Around 2003, gamer expectations were continually rising and becoming more diverse, making sliders a necessity in sports titles. The NBA 2K series had already implemented gameplay sliders by that point, and when we NBA Live gamers heard about the concept, we definitely wanted to see those settings added in EA Sports’ series. The ability to customise gameplay without drastic mass ratings edits sounded like a much better solution. Ideally, we’d be able to devise a set of sliders that a majority of the community would find useful, but if not, we’d all have the ability to individually tweak the game to our liking. It would also save roster makers a lot of time, and eliminate the need to choose between rosters that were optimised for either Franchise mode or gameplay, but seldom ever both. Fortunately, we wouldn’t have to wait very long for that wish to be granted. 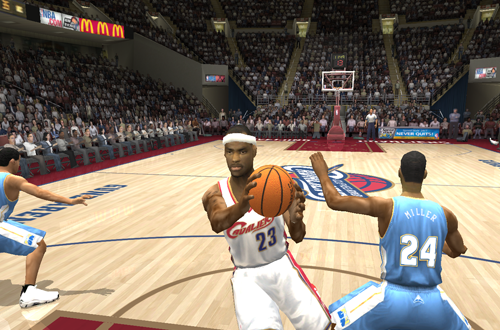 Gameplay sliders were implemented in NBA Live 2004, and as soon as the game came out, the community immediately set about playing around with them. Even though NBA Live 2004 toned down a lot of the exaggerated elements of NBA Live 2003, the gameplay was still a little too fast-paced out of the box, with field goal percentages that resulted in scores being a bit too high. By adjusting both the user and CPU sliders, we were able to achieve very realistic results. We could also choose between and customise two sets of sliders – Simulation and Action – depending on our needs. There were limitations, of course. Sliders couldn’t resolve any issues that were the result of shortcomings in the engine, such as matters related to animations or AI. Play styles, shot selection, and player performance in general still required ratings edits, and results in that regard were hampered by the technical limitation of the era. Still, adjusting the sliders enhanced the gameplay experience noticeably, without any of the drawbacks that were common with tweaked rosters. There was some good new tech in NBA Live 2004, but the addition of the gameplay sliders turned out to be one of the biggest factors in the game’s significant improvement over its predecessor. Devising the “perfect” set of sliders became a goal of the community, and it’s fair to say that we approached it with the same dedication as modding. Of course, this led to a few disputes in the Forum, as not everyone agreed on the ideal settings. Given our differing skill levels and playing styles, as well as variables such as difficulty level and quarter lengths, it was impossible to devise settings that would be guaranteed to suit absolutely everyone. It was therefore important to note those other settings when suggesting a set of sliders, and to emphasise that sliders were intended to be a starting point for further tweaks, depending on the user’s preferences and style of play. 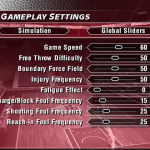 While we were grateful to have the gameplay sliders in NBA Live 2004, it was clear that there was still room for improvement; not only in the core mechanics, but also the available slider settings. For instance, NBA Live 2004 introduced the manual pro hop and drop step moves in its expanded controls; two great additions, but unfortunately they were both a little overpowered, particularly on lower difficulty settings. Oddly there were no sliders governing their effectiveness for the user or CPU, which meant that they could be exploited quite easily. 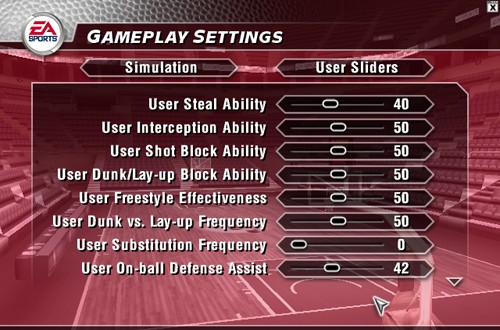 Thankfully, this problem was rectified in the very next release, with NBA Live 2005 featuring sliders for those moves. 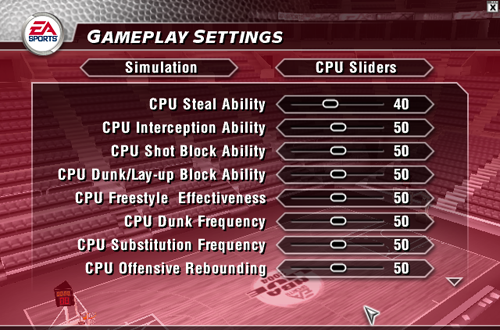 Gameplay sliders remained in the series through to NBA Live 10, and just as player ratings and attributes were expanded for a deeper experience, new slider settings were also added. Unfortunately, after the series went on hiatus and finally returned in 2013 with NBA Live 14, gameplay sliders were nowhere to be found among the settings. It wouldn’t be until NBA Live 16 that they made their return, and fortunately, they’re still available as of NBA Live 18. With sliders and roster editing back among NBA Live’s features, it’s essential that the series continues to be a customisable experience in the years to come, effectively catering to the varied tastes of basketball gamers. Of course, gameplay sliders alone are not the answer to every problem in NBA Live or NBA 2K. While they can significantly change up the experience to our liking, they can’t overcome major flaws in mechanics and AI. Furthermore, slider tweaks are useless in the career and team building modes, as well as online play, because we’re unable to customise the sliders for those experiences. It’s therefore vital that the games are properly tuned for the best experience possible, at least according to the tastes of the majority of basketball gamers. In any mode where we can’t adjust the sliders ourselves, we need them to be appropriately tweaked and balanced for us. Giving us access to the engine and the ability to adjust gameplay to our liking has been one of the biggest developments in sports gaming. It’s not surprising that gameplay sliders have become a standard feature across all genres of sports games, from basketball to football, to hockey and even professional wrestling. While games should deliver an engaging and satisfactory experience out of the box, as well as in modes where sliders aren’t available, the presence of those settings at least provides us with an opportunity to tinker with a game until it feels right. Gameplay sliders may not be an idea that’s original to NBA Live, but we’re glad that the series adopted them.